Home Cleveland for Good We Believe in the Power of Good Books! 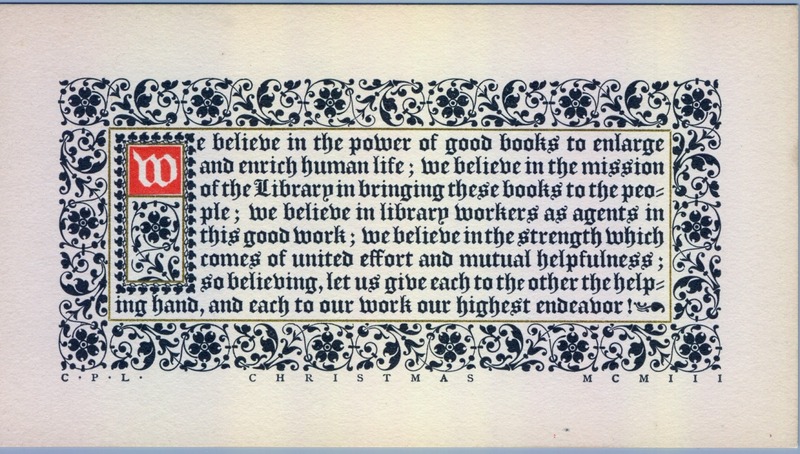 According to a memo from William H. Brett, the Library’s Director from 1884-1918 and one of the nation’s great founding librarians, the card features the “oldest Old English type still in use, cut before 1525, probably at Rouen, France,” a border in “an Elzevir design, made about the 17th century,” and “an initial designed and cut specially for the card.” The straight line borders are in gold. You’ll have to trust us when we say the photograph does not do this card justice—it’s beautiful in person. And while we don’t know the origin of the quote, or if it was written by Brett himself, it’s a message that has stood the test of time and remains just as relevant today.